A kinked demand curve occurs when the demand curve is not a straight line but has a different elasticity for higher and lower prices. 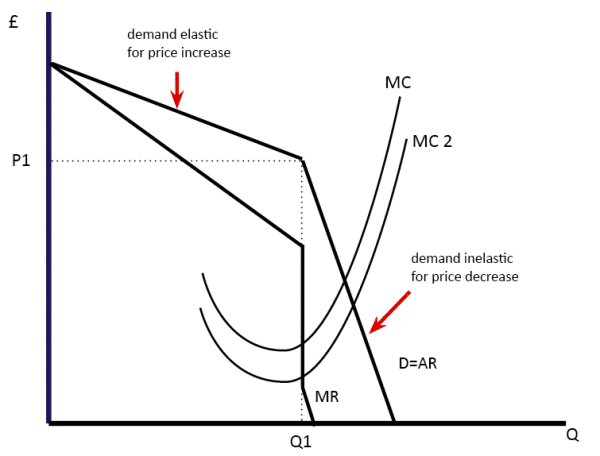 One example of a kinked demand curve is the model for an oligopoly. If a firm increases the price, then it becomes more expensive than rivals and therefore, consumers will switch to its rivals. For a price rise, there is likely to be a significant fall in demand. Demand is, therefore, price elastic. In this case, firms will lose revenue, the percentage fall in demand is greater than the percentage rise in price. However, if a firm cut its price, it is likely to lead to a different effect. In the short term, if it is cheaper, it would cause a big increase in demand and rise in revenue. The firm would gain market share. However, other firms will not want to see this fall in market share and so they will also cut price to follow the first firm. The net effect is that if all firms cut price – the individual firm will only see a small increase in demand. Because there is a ‘price war’ demand for a firm is price inelastic – there is a smaller percentage rise in demand. If demand is inelastic and price falls, then revenue will fall. If the kinked demand curve is true, the firm has no incentive to raise price or to cut price. One possibility is the market for petrol. It is homogenous and consumers are price sensitive. If one petrol station increased price there would be a shift to other petrol stations. However, if one petrol station cut price, other firms may feel obliged to follow suit and also cut price – therefore a price cut would be self-defeating for the first firm. How realistic is the kinked demand curve in practise? In many oligopolies firms may have a degree of brand differentiation. Mobile phone companies can increase the price but consumers are willing to pay because price is not the dominant factor. Some petrol stations may increase price and not see elastic demand because they have the best location. Firms may not want to defend market share. Rather than getting pulled into a price war, some firms may not respond to price cut, but concentrate on non-price competition to retain an advantage. It is not just in an oligopoly where there is potential kinked demand curve.